It has everything anime needs; love, violence, and action. ...The Hakkenden does Rurouni Kenshin, minus the "oro." 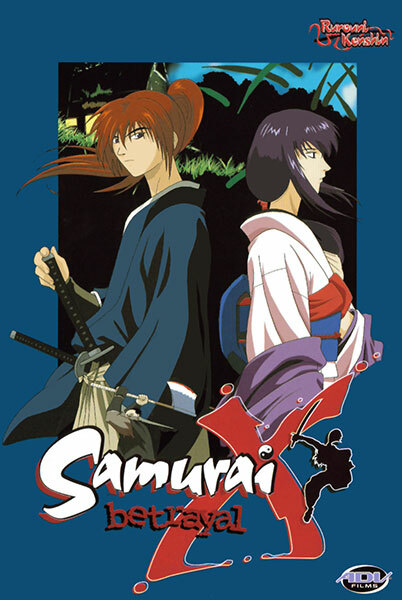 Whether you've watched the Rurouni Kenshin TV series or not doesn't really matter. RK the OAV series is awesome to say the least, and you can enjoy it without any RK background. The tone is solemn, and there is never a comical moment. This seriousness is reflected from the color schemes and composition of the scenes to the way the characters speak. Even the music reinforces this mood. The fights are virtual bloodbaths. People are slashed left, right, and center. You'll definitely be seeing a lot of samurai action and a whole lot of red. For those who've watched the TV series or read the manga, you'll find that the Kenshin here never lectures his foes to submission. He just kills, kills, kills... and you'll come to understand how he gained the title of "Battousai." You'll also discover how he got that X scar on his cheek. Characterization is excellent, as is always the case with RK. A lot of insight and depth is provided as to why these people are the way they are. You would really feel as if you knew them personally, which makes it easy to empathize with whatever it is that's happening onscreen. The cinematography is superb. The scenes were obviously composed with a lot of thought as to convey additional meanings and emotions in every frame. The art and animation are very good, and a lot different from the TV art. The way the faces are drawn in particular reminded me of the style employed in "Serial Experiments Lain". The English dubbing is fine, I just can't stand their mispronunciation of "Tomoe." The original Japanese version features seiyuu Junko Iwao (also Mima in "Perfect Blue," Ceres in "Ayashi no Ceres"). RK the OAV series is easily one of the best OAVs out there, and that's coming from one whose fave genre isn't even action. Rurouni Kenshin: The Remembrance is Copyright © N. Watsuki/Shueisha, Fuji-TV, SPE Visual Works, and possibly others. English version ADV Films. Any images are the property of their respective rightsholders, and included for review purposes only under the fair-use clause of US copyright law.